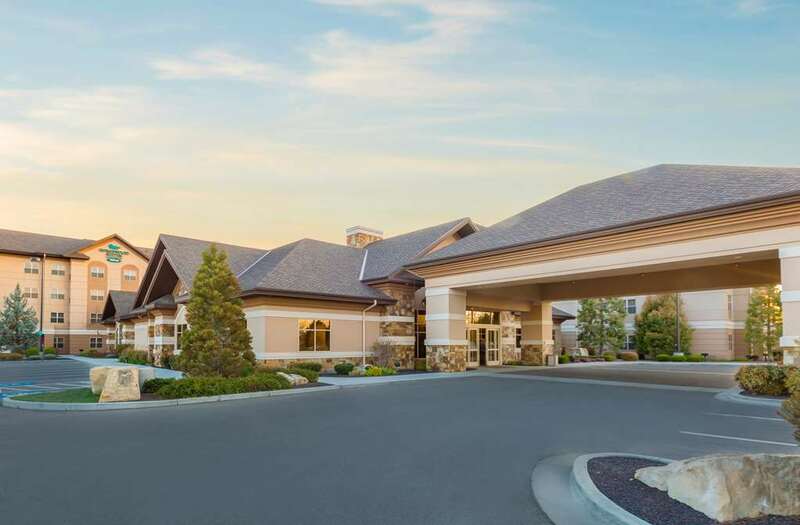 This hotel is 100pct non-smoking This upscale extended-stay hotel is the first of its kind in Boise Idaho making this property distinctively Homewood Suites. Our unique Homewood Suites by Hilton Boise hotel is located on the corner of Boise*s largest theater complex Edward*s Cinemas with 21 screens and IMAX Theater. Our guests have convenient access to more than ten restaurants within walking distance as well as Costco located adjacent to the hotel. We are centrally located in Idaho with easy access to the Boise Airport Boise Towne Square Mall I-84 Birds of Prey sanctuary and city center. Most locations and businesses can be reached within ten minutes of the hotel. Make yourself at home in Idaho at the Homewood Suites by Hilton Boise hotel in one of our studio one-bedroom or two bedroom suites featuring fully equipped kitchens with full sized refrigerator microwave stove top and dishwasher. Join us for a complimentary Suite Start hot breakfast buffet served daily in our Lodge. In the evening meet our managers at our complimentary Welcome Home Reception Monday through Thursday featuring a light meal with beer wine and soft drinks. Guests also enjoy complimentary local phone calls complimentary high-speed wireless Internet 24-hour exercise room billiard room 24-hour on-site laundry facilities complimentary grocery-shopping service and our 24-hour Suite Shop with snacks and sundry items. Make yourself at home. McGrath*s Fish House: Fresh fish and seafood for over 25 years. Cracker Barrel: Old fashion home cooking. Legends Pub and Grill: Sports bar with multiple televisions broadcasting various sports event. Serves sandwiches soups salads and steaks. Goodwood BBQ Company: Specializing in barbecue and slow cooked entrees.